This highly accessible site is located near one of the largest railway junctions in the Netherlands. This business centre is located in one of the most sought after business addresses in the city, offering both co-working and private offices at affordable rates. Within the immediate area, there are lots of local amenities in which you can entertain and impress clients, as well as many entertainment venues to visit with like-minded colleagues! The business centre provides a hub for new start-ups, innovative entrepreneurs and large established businesses.There is a wide range of offices on offer, including window/interior offices, office suites with meeting rooms and coworking spaces. These spaces come fully furnished and serviced, with plenty of natural light to keep you motivated and productive. Supermarkets are within a short driving distance for your convenience. These fully furnished offices in Amersfoort are part of ‘De Hoef’; a well known business park in the Netherlands that accommodates various companies in the financial and IT sector. Professional interiors and superb facilities include: meeting rooms, parking, elevators and immediate access to internet and phone lines. Alongside this occupants have 24 hour access to the building and can benefit from being in walking distance from the closest train station. Its superior location in the Netherlands means that you are situated 500m from the A1 and A28 motorway intersection heading to Amsterdam and Utrecht. Located in the railway station in the centre of Amersfoort, this cutting-edge centre is well connected and easily accessible. This centre offers a range of office solutions, along with every support service your business might require. This is a spacious, professional and comfortable modern business environment, which can be accessed easily from many road links as well as public transport. You can find the Onze Lieve Vrouwetoren just 10 minutes away, and there are several events venues within walking distance. A modern, newly furnished office that has a number of different rooms that would suit a wide range of companies. Whether they are experienced companies or a start up looking for new opportunities, this is a great place to run your business from. Meeting rooms, bike racks and showers are available and it is all served by friendly staff and serviced by a cleaning team. The centre is close to Amserfoort Train station, which has access to regular trains. The airport is within an hour's drive and major roads are easily accessible too. This functional, modern office building is located on the edge of Amersfoort in the heart of the Netherlands, making all major Dutch cities very easy to reach by car and train. 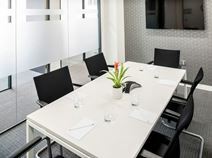 The facilities incorporate all the necessary requirements of a professional office space with a restaurant in the building, a welcoming reception area and 5 available conference rooms for collaborative meetings and negotiations. Situated right next to the Amersfoort main railway station, this business centre is conveniently located within a short walking distance of the city centre. The building is modern, providing a range of comfortable and convenient office solutions including private offices, co-working areas and meeting rooms. Offices are fully furnished and well equipped, with high speed internet. The centre is easily reached and surrounded by plenty of local amenities.